1. 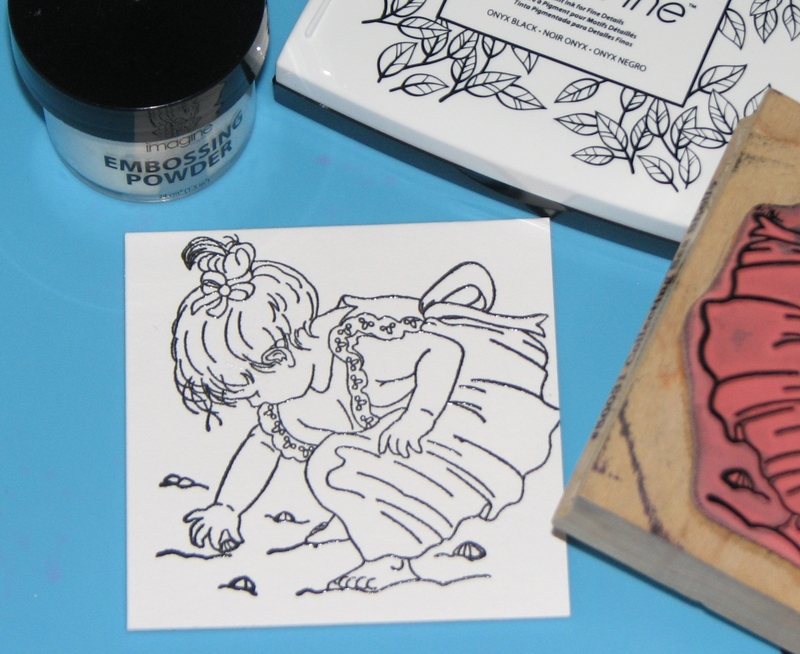 Stamp the image with VersaFine ink and emboss with clear embossing powder. 2. 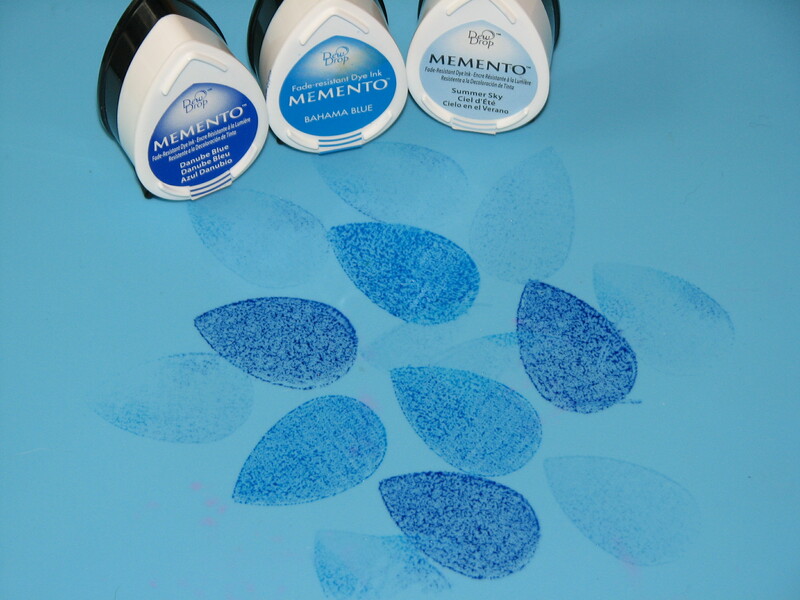 Watercolor the image by pouncing desired color of Memento ink onto the craft mat and pick up the ink with a water brush and paint the image as desired. The following colors were used to color this image: Danube Blue, Summer Sky, Desert Sand, Toffee Crunch, Rich Cocoa, Cantaloupe and Angel Pink. 3. 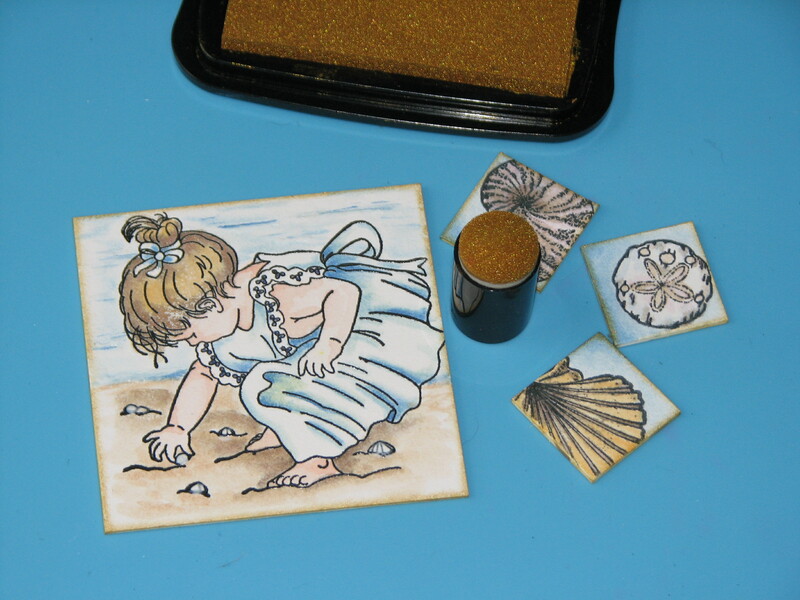 Stamp and emboss shell images onto 1″ matboard squares and watercolor these images as in step 2. 4. 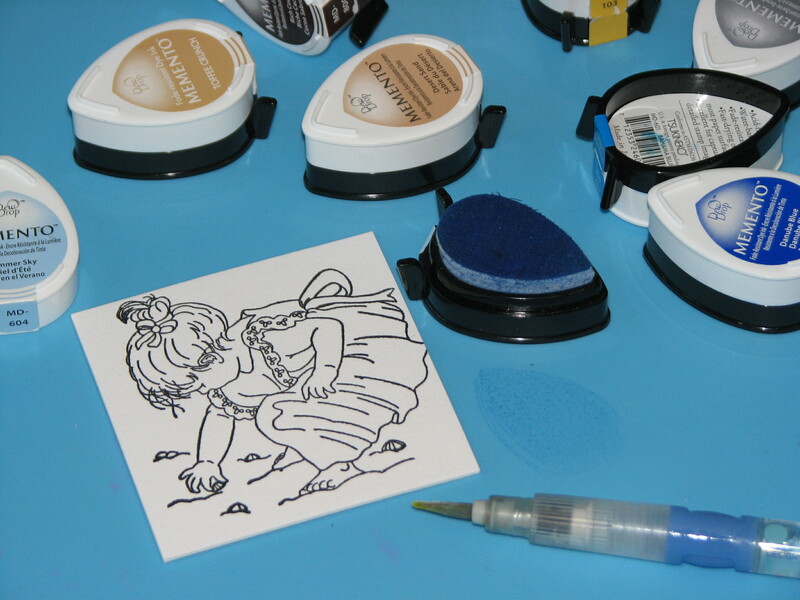 Use a Sponge Dauber to apply Delicata Golden Glitz to the edge of each image and mat on black cardstock. 5. 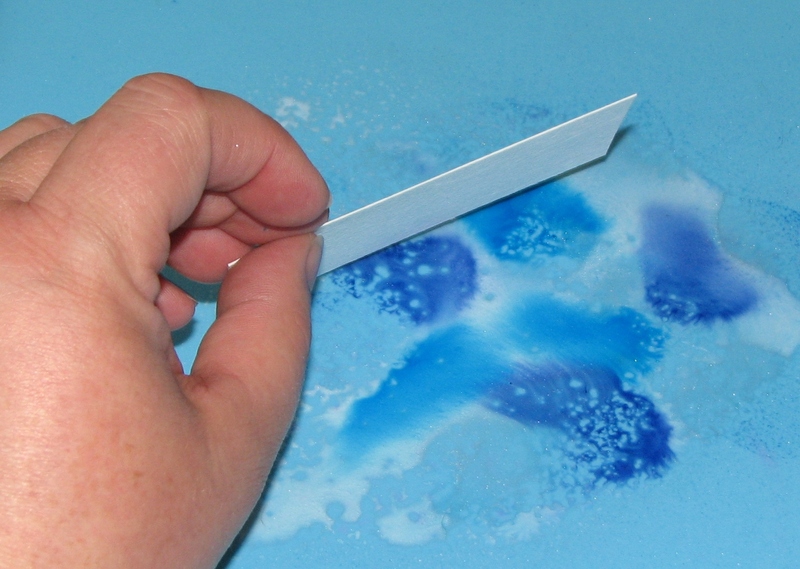 Cut a piece of watercolor paper 2 1/4″ x 3 3/4″. 6. Pounce Summer Sky, Danube Blue and Bahama Blue Memento ink onto the craft mat and spritz the ink with Frost Sheer Shimmer Spritz. 7. Press the watercolor paper into the ink mix and lift to create a unique monoprint, then mat on black cardstock. 8. Cut a piece of watercolor paper 4 1/8″ x 5 3/8″. 9. Pounce Toffee Crunch, Desert Sand and Summer Sky Memento ink onto the craft mat and spritz with Frost Sheer Shimmer Spritz. 10. Press the large watercolor panel into the ink mix and lift to create a second monoprint and mat on black cardstock. 11. 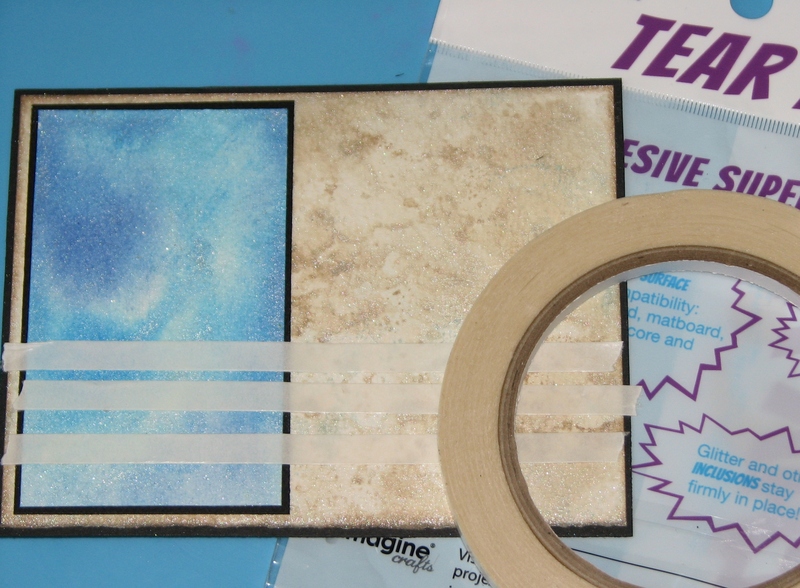 Affix the large panel to a blank card base, then affix the smaller blue monoprint to the card with Tear It! Tape. 12. Tear off 3 strips of tape and adhere across the bottom portion of the card and adhere a strip of burlap fabric to the card. 13. 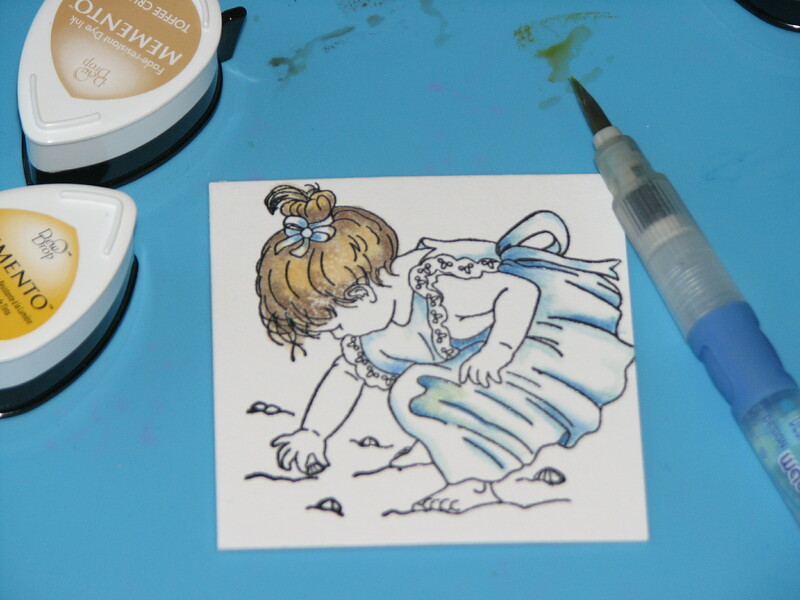 Mount the watercolor images to the card, then add highlights to the main image with Wedding Dress and Shimmer Pico Embellisher. Finish off the card by adding 3 dots of Bronze Pico Embellisher to the corner.